Jack-in-the-Pulpit (Arisaema atrorubens)… also sometimes called Indian Turnip because the root is shaped like a turnip… is a unique wildflower. 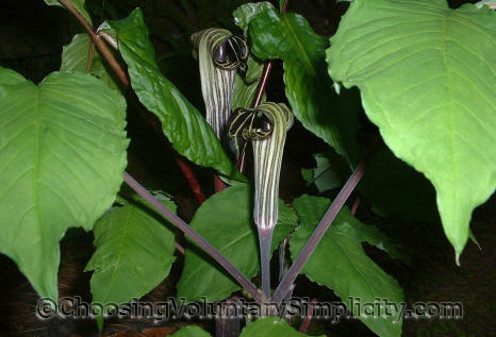 There are several species of jack-in-the-pulpits, all members of the Arum family, and they all look about the same with the little “jacks” peering out of the “pulpits.” We have the woodland type here growing abundantly in areas where the soil is moist. 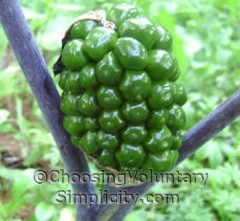 What is commonly called the jack is actually a spadix, and the hood is a spathe. 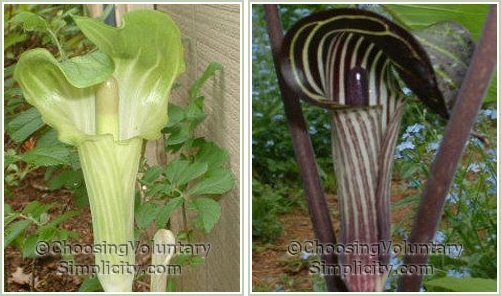 The true flowers of this plant are hidden at the very base of the spadix, inside the spathe. The leaves are large and tower above the jack itself. Each large leaf is divided into three smaller leaflets. In late summer, both the jack and the hood dry up and if the flower was female a seed pod that looks like a cluster of green berries appears in their place. The berries ripen into a brilliant red by early fall, with each berry containing one or more seeds… and it’s easy to prepare the seeds for growing new plants. 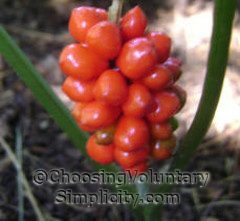 There are red woodland jack-in-the-pulpits and white woodland jack-in-the-pulpits… often growing side by side… but the white are usually harder to find. This year we have a giant white “volunteer” specimen at the edge of one of my gardens that is nearly four feet high and still getting taller. The larger size is not unusual… if the soil is very rich and very moist jack-in-the-pulpits readily grow to be three feet tall or more. Under more average conditions they will stay at around ten to twelve inches high. Note: The seeds and berries may be poisonous if ingested, so keep them away from children and pets. I love these! I sent to a nursery and bought two plants. They are not doing bad and this year one had some seeds that are just now turning red. I’m going to try starting new plants from the seeds per your directions. Thanks for sharing. These are great photos. Jack in the pulpits aren’t native to my area but I wish they were. I have always been intrigued with the way the hood comes over the jack inside the pulpit but I had never seen such good pictures of them before. Again my thanks. My grandpa always called these indian turnips but I had forgotten that until I read the name in this article. Thanks for the memory!